Embassy has marked the sad anniversary on March 20, 2014 by the projection of documentary film "Crime Without Punishment", attended by around 30 representatives of Israeli political and public life, diplomatic and military corps, media and Association of Jews from former Yugoslavia. 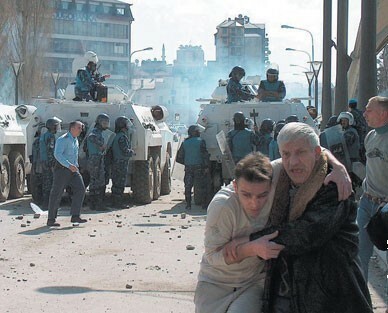 Ten years ago, on March 17 and 18, 2004, violence broke out tremendously in Kosovo and Metohia. Nineteen people were killed, eight of then Serbs, while 11 Albanians lost their lives in the fight against the international security forces. Two citizens of Serbian nationality are still accounted missing. 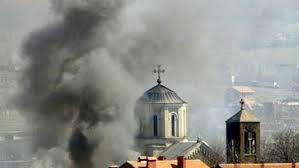 More than 950 people were injured, more than 900 Serbs, Roma and Ashkali homes were torched, 4,000 people were expelled from their homes, nearly 100 Serbian churches and monasteries were destroyed and desecrated. Six towns, and nine villages were ethnically cleansed, 935 Serbian houses and ten public buildings were destroyed, burned or damaged. 72 UN vehicles were destroyed. During the violence 39 temples of the Serbian Orthodox Church were destroyed and burned to the ground, including 18 cultural monuments, such as the temple of Bogorodica Ljeviška in Prizren (UNESCO listed). 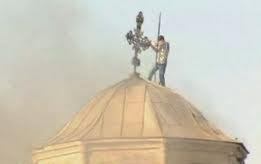 Priceless cultural heritage, thousands of icons, and other religious relics, old and rare books, documents of the Serbian Orthodox churches in Kosovo and Metohija were destroyed, damaged, lost or accounted missing. International prosecutors and judges in Kosovo prosecuted seven cases of destruction of churches and 67 people were sentenced to prison terms ranging from 21 months to 16 years. Motive and pretext for the Pogrom was the local campaign in which the Serbs were accused of forcing with dogs Albanian boys to cross the Ibar river; three boys drowned in the river. UNMIK police investigation found that the allegations were false, and international police spokesman at the time stated that "surviving boys were under strong pressure from Albanian journalists and politicians to accuse Serbs from the neighbouring villages". At first, protests of Kosovo Albanians broke out in the southern part of Mitrovica, which later became armed attacks on Serbs in northern part of the town. Ten years after the March violence in the province, Serbia continues alerting the international community to the ever-present threat to the local Serbian population and continuous campaign of intimidation carried out by some of the Kosovo Albanians. The incidents in Kosovo, which are listed in the report of the UN Secretary-General were a part of an orchestrated campaign of intimidation directed towards Kosovo Serbs, in order to continue the ethnic cleansing and total annihilation of the Serbian cultural and religious heritage. More than 200,000 non-Albanians were expelled from Kosovo and Metohija since June 1999, with only a few returning to their homes since. The international community at the time rated the "ethnic violence" against Serbs in Kosovo and Metohija "planned and well orchestrated". Albanian extremists' terror was later condemned by the UN Security Council, and the EU; the Parliamentary Assembly of the Council of Europe on April 29 2004 passed a relevant resolution. Even ten years after the expulsion, most victims of the March pogrom against Serbs have not returned to their homes, many are still in collective centres, container settlements or other people's houses in the status of internally displaced persons. It is expected that, within the dialogue between Belgrade and Priština, the issue of protection of cultural and historical heritage and enabling the permanent return of internally displaced persons to Kosovo an Metohija will be one of the most important chapters of the dialogue that has already for a year successfuly been carried out with the active support of EU High Representative for Foreign Affairs Mrs. Catherine Ashton.